"Qi" as it appears in old Chinese (shamanic) or Daoist documents. Qi 氣 is the basic element of the Universe. It is the same character found in the term Qigong 氣功. Most Chinese do not recognize the other written character (Qi 炁) that I am using as it only appears in old Chinese Wu 巫 (shamanic) or Daoist documents. 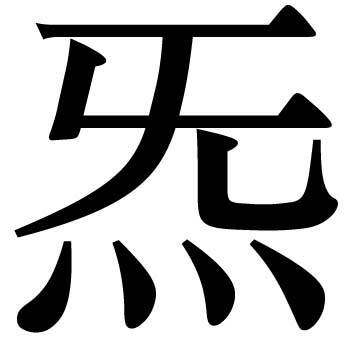 The ancient character Qi 炁 is made with the upper radical Wu 无 and the bottom radical Huo 火. Wu means no, nothing, without, empty, emptiness, and the primordial state of nature or the Universe. Huo means fire. It is a symbol for mind, heart, spirit, desire or anger in Chinese traditional spiritual cultivation. The distinction between the two characters can help us understand that the Qi 炁 referred to in ancient shamanic and Daoist texts is the refined or spiritualized Qi 氣 that is connected with the origin of your life and of the Dao. The lesser known Qi (炁) also means the vital breath of the Dao or of nature. Once you can transform your vital energy Qi 氣 to spiritually refined Qi 炁, you reach a higher level in your Qigong practice and will feel your whole physical and spiritual body merging into a state of emptiness. In this purified state, your basic Qi 氣 is completely refined. You may feel as though your whole physical body is melting into warm sunlight. Your mind will be calm and relaxed without desire, anger, sadness, longing, worry or excitement. Your consciousness, now fully awakened, will enable you to sense things that are happening within and outside your body. The above entry was taken with the author's permission from his book, Chinese Shamanic Cosmic Orbit Qigong, pg. 79. Singing Dragon, 2011.